By keeping an eye on the weather forecast, you can make sure you’re prepared for any possible extremes. Watch out for severe weather warnings from Environment Canada, whose reports are regularly updated. It is then possible to ensure your properties are as storm-proof as possible should the weather takes a turn for the worse. Although many of us fear the thunder and lightning that comes with a big storm, it is often the wind and rain that cause the most damage. Buildings surrounded by trees are particularly susceptible to strong winds and its vital that loose branches are cleared on a regular basis. Similarly, unstable trees or fallen branches can be blown into your own property or a neighbouring building, causing extensive damage, danger and expensive repairs. By keeping your trees trimmed and stable, you can avoid extensive storm damage and stabilize your rental income throughout the year. Speak to Latitude Limited about their options for year-round maintenance and storm-proofing options. Most contemporary homes are fitted with a safety switch that will automatically turn off all power sources and prevent subsequent damage caused by electrical surges. Lightning strikes can cause power surges, shock wave damage and even fires. Not only do these cause widespread damage to the property, they also endanger the lives of residents and neighbours alike. For a landowner, this is a potentially devastating situation, leading to complex court cases and heavy losses. If your rental property doesn’t already have a safety switch fitted, contact a professional electrician about having one installed. High winds can funnel through the home if the doors and windows do not close properly or are susceptible to drafts. In the event of a storm, these winds can reach over 100kph which are strong enough to blow the roof off a normal residential property. This would lead to the property being empty for some weeks while essential repairs were being performed. 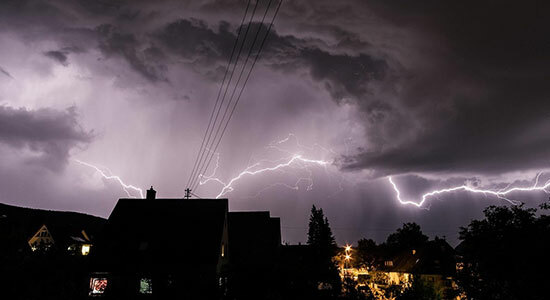 While few of us are experts on the external warning signs that a property is not suitably protected against a possible storm, a quick check outside before bad weather hits is always a good idea. While walking around your property, look out for any items in the yard that could become hazardous projectiles. Similarly, if heavy rain is predicted, make sure all gutters are free of debris to prevent the possibility of overflow that can pour down the walls, damaging the foundations and leading to costly renovations. In areas where electrical storms are commonplace, residences may lose all power for several hours or potentially days. By having a generator available for such emergencies, you’ll be able to minimize the amount of disruption to your residents’ normal routine. A generator will ensure your tenants can remain in the property, and paying rent, while the main electricity source is repaired. Overall, having comprehensive home insurance, ensuring the safety of your buildings and employing a team of experts, such as those at Latitude Limited, who offer maintenance plans that safeguard your properties throughout the year, and particularly during the hazardous Fall storm season.